I wrote about this a year ago when I first made it but after making it again this weekend I felt compelled to tell you about it (and give you the recipe this time). It is truly delicious and, aside from the dough rising, quick. This time I threw some prosciutto on before it went in to the oven and some arugula when it came out, adding both protein and veggies. I used about 1.5 oz. of prosciutto but keep in mind that it will shrink as it cooks so if you really want the meat to cover the pizza over-do it a little. The greens were a handful of baby arugula tossed with 2 teaspoons of olive oil, some Maldon salt and fresh ground pepper (take it easy on the salt if you are using the prosciutto). The crust might be my favorite part. It’s chewy and a little crispy and tastes so good the next day you can eat it cold, right out of the fridge. As I mentioned last time I made it, the cooking method – starting on the stove top and then into the oven – was, truthfully, fun. Try the cheese, try the prosciutto, try some feta and olives, kale if you must. Just remember: it will really only serve two. Or one if that person’s had a bad day. Not that I endorse medicating oneself with food. Well, ok, go ahead, it’s got to be better than opioids, right? Transfer dough to light floured counter and shape into tight ball. Place dough in large, lightly oiled bowl and cover tightly with greased plastic wrap. Let rise at room temperature until doubled in size, 1 to 1-1/2 hours. When topping ingredients are ready, place dough on lightly floured counter. Press and roll dough into 11" round. Transfer dough to prepared skillet; reshape as needed. Adjust oven rack to upper-middle position and heat oven to 500 degrees. Grease 12" ovensafe skillet with 2 tablespoons oil. With machine running, drop garlic clove into food processor. Add tomatoes, salt and remaining 1 tablespoon of oil and pulse until coarsely ground, about 12 pulses. Transfer mixture to liquid measuring cup and add reserved tomato juice until sauce measures 1/2 cup. Spread sauce over dough in skillet, leaving 1/2" border at edge. Sprinkle mozzarella and parmesan evenly over sauce. Arrange slices of prosciutto over cheese. Set skillet over medium-high heat and cook until outside edge of dough is set, pizza is lightly puffed, and bottom crust i is spotty brown when gently lifted with spatula, about 3 minutes. Transfer pizza to oven and bake until crust is brown and cheese is golden in spots, 7-10 minutes. Using potholders, remove skillet from oven and slide pizza onto cutting board. Let pizza cool for 5 minutes. Toss arugula with the 2 teaspoons oil, a pinch of salt and pepper. 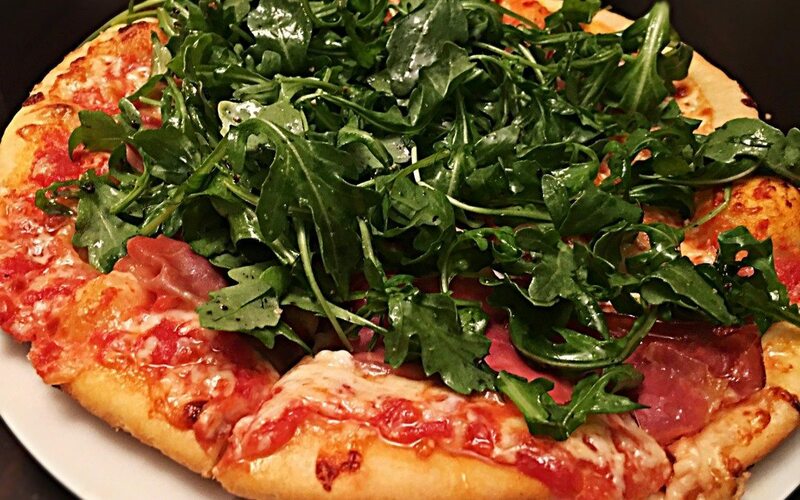 Top Pizza with arugula. Slice and serve.